TPP wheels have sealed precision ball bearings and full thread guards. Smooth rolling and quiet. For use in many medical applications. Polished chrome finish. Metal thread guards are available. Consult factory. 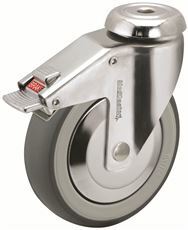 | Fork Style: total lock | Fork Material: chrome | Wheel Diamter: 4" | Tread Width: 1-1/4" | Tread Material: Thermoplastic Rubber | Wheel Bearing: Precision Ball | Load Height: 5-5/16" | Load Capacity: 240 lbs | Swivel Radius: 4-35/64" | Fitting Type: top plate, 2-1/2" x 3-5/8"